Beautiful, athentic log cabin with 2 queen sized beds, living area with kitchenette and pull out sofa bed, flat screen TV, WiFi, air conditioning and telephone. Beautiful log cabin with 2 queen sized beds, kitchenette, hide-a-bed couch, air conditioning, television and telephone. This cabin is not pet-friendly. This one-of-a-kind Suite includes two rooms, a bedroom with a king size bed and a living room with a fold out bed. The room also includes a full kitchen (refrigerator, stove top oven, microwave), air conditioning, LCD flat screen televisions, telephone, and alarm clock. 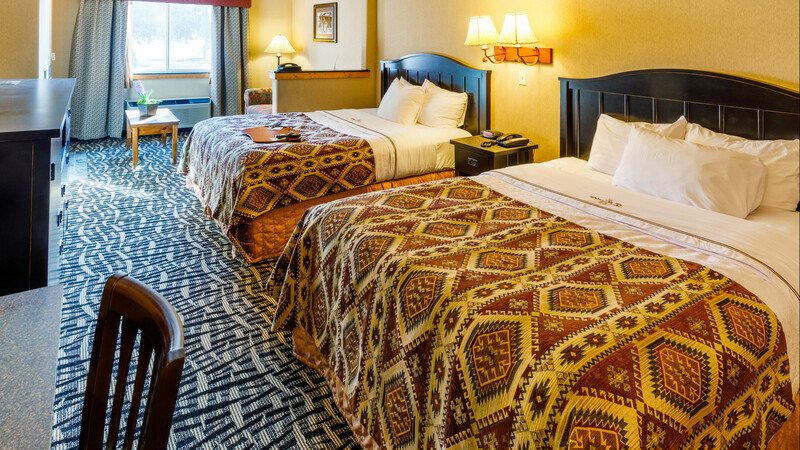 The King Suite may be reserved by contacting us directly at (307-733-2364). 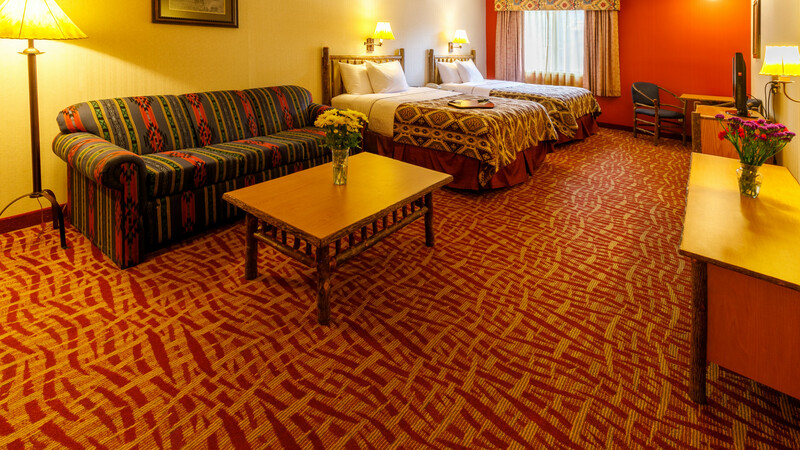 Our rooms feature 2 queen sized beds, television, telephones, and complimentary wireless internet. Quaint cedar log room with 2 double beds, television, telephone, and wireless internet access. King fireplace room with king sized bed in front of beautiful moss rock fireplace, refrigerator, microwave, coffeemaker, telephones, and wireless internet access. Large family fireplace room with 2-4 beds and a beautiful moss rock fireplace. Includes refrigerator, microwave, coffeemaker, television, and wireless internet access. Spacious suite with 4 beds, two full bathrooms coffeemaker, television, and wireless internet.. 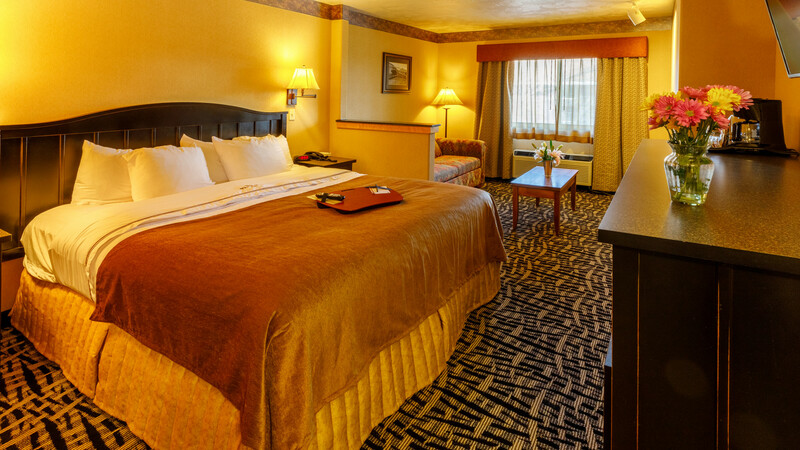 The Suite may be reserved by contacting us directly at (307-733-2535). Spacious suite with 3 beds two full bathrooms and full kitchen(refrigerator, stove top oven, microwave), coffeemaker, television, and wireless internet access.. The Suite may be reserved by contacting us directly at (307-733-2535). One queen bed, kitchenette, cable TV, telephone, and a sofa sleeper in a studio style log cabin with custom log furniture. One King bed, kitchenette, television, telephone, and a sofa sleeper in a studio style log cabin with custom log furniture. Two queen beds (bunk style), kitchenette, sofa sleeper in a studio style log cabin. Two room log cabin with one king bed in the bedroom, a sofa sleeper in the living room, and kitchenette. Includes television and telephone. Two room log cabin with two queen beds in the bedroom, a sofa sleeper in the living room, and kitchenette. Custom log furniture, television, and telephones. 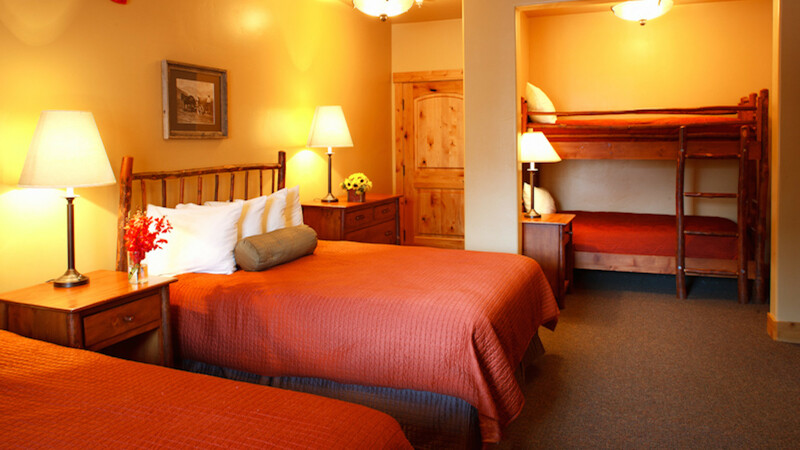 One King bed and sofa sleepr located upstairs in the lodge with refrigerator, microwave, LCD television, and telephone. 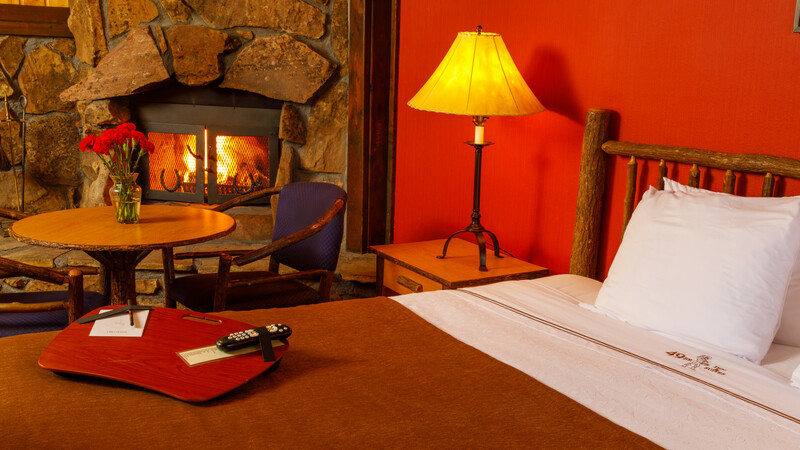 (Perfect combination to book with the Lodge Family Suite). 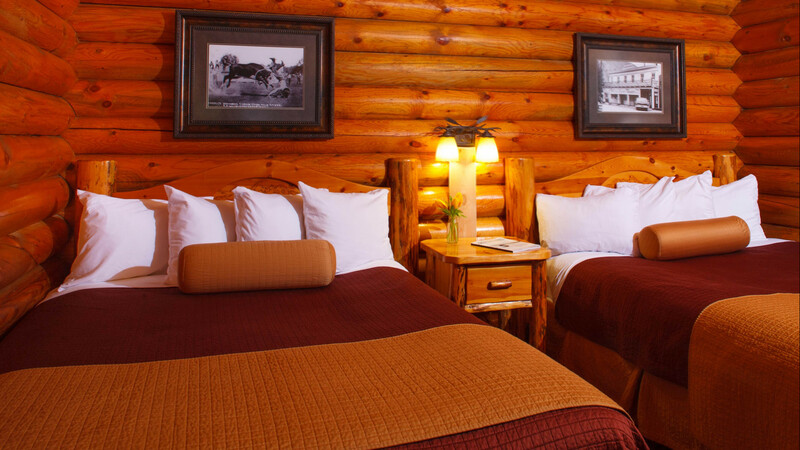 To reserve the Lodge Rooms call directly at (307) 733-3121. Two queen beds plus a set of twin bunk beds, with full kitchen (stove range top,dishwasher, microwave, full size refrigerator), television, telephone,alarm clock, and spacious bathroom. 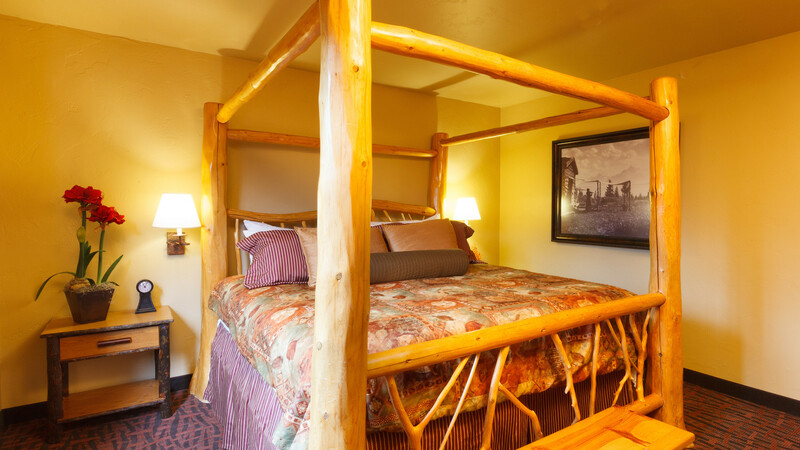 (Ideal to book with Single King Lodge room) To reserve this room contact us directly at (307) 733-3121. 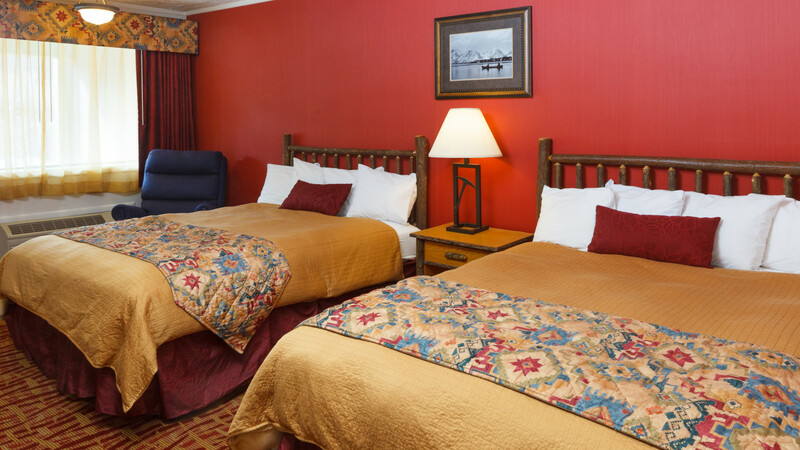 Spacious room with 2 queen-sized beds, television, telephone, and complimentary wireless internet. Incredibly spacious studio suite with two queen sized beds, television, telephone, refrigerator, wet bar and microwave, and complimentary wireless internet. Note: there is no elevator accessibility in these suites. Guests must use one flight of stairs to access the rooms. 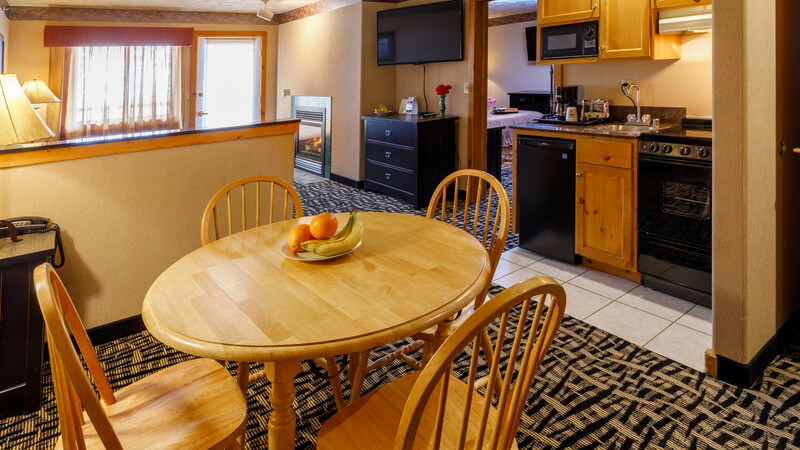 Spacious room with 2 queen-sized beds, sofa sleeper, moss rock fireplace, refrigerator, microwave, coffeemaker, television, telephones, and wireless internet access.The Family Fireplace Rooms may be reserved by contacting us directly at (307)733-7550. 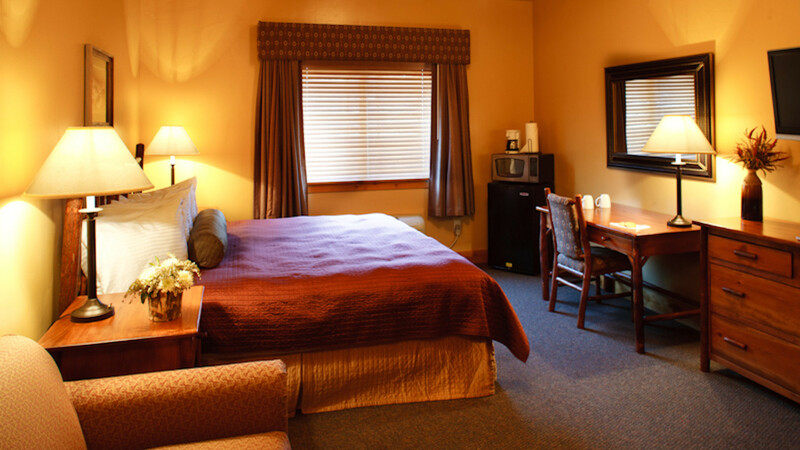 Room with king-size bed, refrigerator, beautiful moss-rock fireplace, and wireless internet access.The King Fireplace rooms may be reserved by contacting us directly at (307)733-7550. Suite with a king sized bed, marble-framed gas fireplace sitting area and sofa sleeper, microwave oven, refrigerator, coffee maker on a granite countertop, telephone, and wireless internet access. Suite with 2 queen sized beds, marble-framed gas fireplace sitting area and sofa sleeper, microwave oven, refrigerator, coffee maker on a granite countertop, telephone, and wireless internet access. Luxury suite with 2 rooms. Jacuzzi in front of the marble-framed gas fireplace. Full kitchen, steam shower, granite counter tops and knotty pine decor. 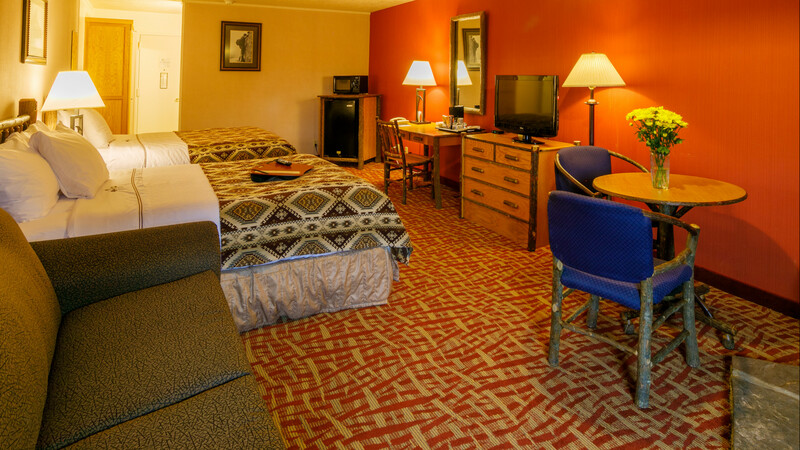 Telephones and complimentary wireless internet.The Suite may be reserved by contacting us directly at (307)733-7550.